The island's largest and perhaps most beautiful village. 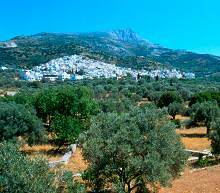 It's in a delightful setting on the side of Mount Zeus, from where the view of the surrounding areas is breathtaking. The white houses and the paved streets make a wonderful contrast against the grey flanks of the mountain and the green of the valley. If you walk up to the top of the village you can visit the church of Panagia tis Filotitisas. It has a white marble icon screen and beautiful icons. The local festival is in honour of the Virgin Mary and lasts three days, from 14 to 16 of August, when there is traditional singing and dancing and general feasting.